MORE DETAILED RATES BELOW. PLEASE SCROLL DOWN TO SEE RATE CHART AND RATE NOTES. STATE AND LOCAL TAX, CLEANING FEES AND PET FEES ADDITIONAL TO ALL RATES. ON-LINE PAYMENT OPTIONS AVAILABLE. WE OFFER FRIDAY-TO-FRIDAY RENTALS FOR EASIER FERRY RESERVATIONS, SMOOTHER CHECK-IN, CALMER TRAVEL. 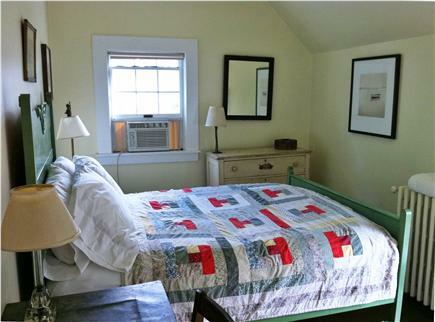 LOCATION: 26 WING ROAD, OAK BLUFFS, MARTHA'S VINEYARD. All the charm of a 19th century farm house. Walk 6/10 mile to downtown or 7/10 mile to the beach and swimming. 3 bedrooms, 2 full bathrooms, enclosed outdoor shower. Sleeps 6 people. Two enclosed yards. Off-street parking. Pet friendly with owner approval. High-speed internet access, telephone, excellent cellular reception, cable TV, DVD, stereo, washer, dryer, dishwasher, beach towels and beach chairs. Air conditioning in all bedrooms. Ceiling fans in all bedrooms. Wood floors throughout. Many amenities. 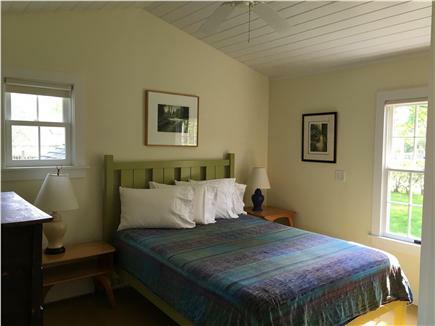 Upstairs lends a cozy cottage feeling with its two lovely bedrooms and generously sized full-bath. An additional bedroom and another large full-bath are located on the first floor. Downstairs has an open floor plan and sunny atmosphere. 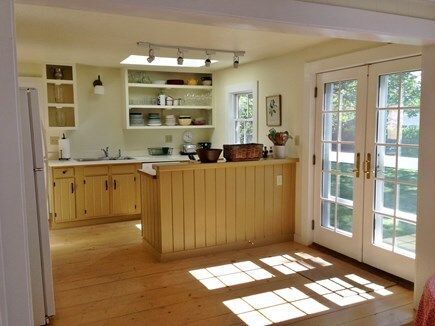 Very pleasing and beautiful light enters this attractive and comfortable house. The fully-equipped kitchen, dining area and living room all flow together into one great room to gather friends and family. Off-street parking for 4+ cars. French doors lead to a privet-hedge-enclosed yard with mature trees, perennial flower beds, outdoor furniture and grill: your secret garden oasis for privacy and relaxation or entertaining. Another fence-enclosed play yard / pet yard is provided for a safe and perfect place for children and pets to play. It is vast and lovely. From the front porch, sit on the rocking chairs and watch the world go by as everyone heads in and out of the incomparable town of Oak Bluffs. Oak Bluffs is one of the six towns on Martha's Vineyard Island, which is located off the shores of Cape Cod, Massachusetts (equidistant from Boston and Providence.) 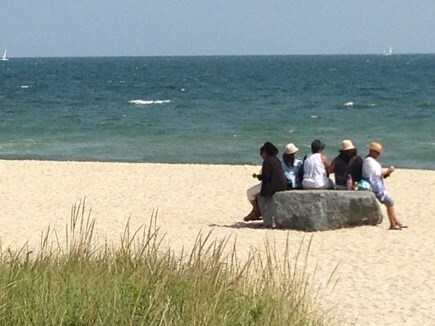 Of all the towns on Martha's Vineyard, Oak Bluffs is the most fun! It's got flair. It's got vibe. This is the town with the nightlife! The activities, events and attractions in this unique village are numerous and varied. Beaches, golf, harbor, shopping, nightlife, arts, restaurants, African-American culture, fishing, jogging, tennis, swimming, festivals, music and more. Come to Oak Bluffs! There's no place like it in the world. Additional availability info: JULY&AUGUST 2-WEEK RENTAL MINIMUM MAY APPLY. Refundable security deposit:1-2-wk $500,3-4-wk $1,000. Additional pricing info: Cleaning:1-wk$280,2-wk$330,3-4-wk$380,6+pers add$50. PetFee:$100/wk PER PET,$125 for heavy shedders. State and local taxes of 11.7% will apply. One bedroom and one full-bath are located on the first floor. No wheelchair access but suitable for elderly or those who can manage a few steps up or down. My wife and I rented the house for 2 weeks and had a fantastic time! The house is very well stocked/equipped with everything needed, including food and water bowls for our dog, which was a nice touch. The layout is great, with one bedroom/bath downstairs, and the other bedrooms and bath upstairs at the opposite end of the house. We had some friends join us for a few days, but the layout gave us all privacy. The yard is HUGE, and we spent quite a bit of time out there with our dog. 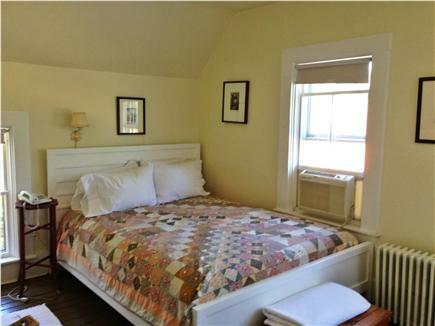 We have stayed at the Oak Bluffs Farmhouse 2 years in a row for a vacation week and totally enjoyed our stay there. The house is well appointed with everything we could ever need. It is cozy and bright. 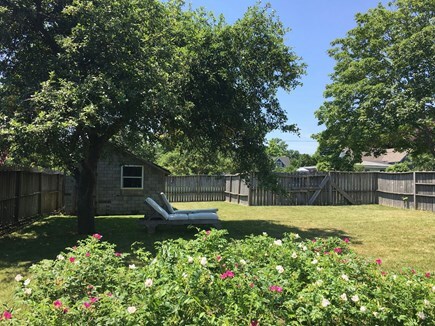 We love the spacious, well landscaped yard areas the most. We walked to town almost everyday for meals, to the beach, or a park. Ellen, the rental agent, is easy to work with, extremely professional, and responds to any question or request immediately. We would definitely stay here again. We spent two lovely weeks at this beautifully-appointed property. 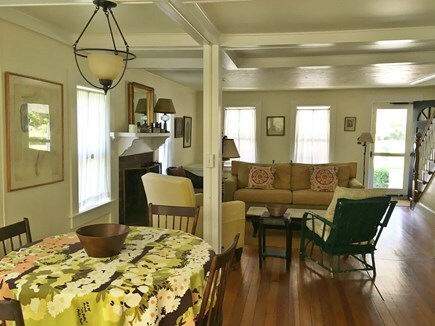 The house is relatively small -- a gracefully refurbished farmhouse -- but accommodating and comfortable for two adults plus teen. Everyone gets their own room with plenty of well-maintained and private outdoor space for all. Nice porch to watch the world go by. Can't beat the location, so close to all our OB favorites. Ellen was attentive and responsive throughout. We will definitely look forward to a repeat visit. From the moment we arrived, it felt like home. The home is everything that anyone could hope for; a perfect Vineyard experience. It was immaculate, beautiful and best of all authentic. The property manager couldn't have been more wonderful. She went beyond the call of duty! I am so grateful for the beautiful memories. We were a party of 4 - 6 with two young children and enjoyed our stay. The house was clean, linens and towels like new, and appliances all updated. The space was bright and airy with tons of outdoor space. While the front of the house is on a busy road, there is a large gated space in the yard for pets/young kids. Walk to town easy for an adult, stroller needed for young child but there are sidewalks the whole way and Tony's market super convenient for food/beverage needs. This home is a simple and charming farmhouse with a country flair and has a relaxing feel from start to finish. The country kitchen, wood floors and the westerly breezes that come in to the house through the french doors put you at ease immediately. Clean, well maintained, and well managed, you will not find much to be disappointed about. Close to town and beaches. Our family truly enjoyed it. We had a great time, despite a brief storm. Ellen was great, so helpful. Sent a text the morning of arrival so that I had her contact number while in the home. Spacious home, charming, very clean and neat. Although we did not do much cooking in, everything was there if needed. The fenced in yard in the back was great for our pup. Location is central to everything. Worked out great for us. Better than the photos. House is charming and super-clean. Both yards are spacious and well-kept. Excellent booking experience. Manager responsive yet unobtrusive. Security deposit returned in a timely manner. Perfect location in a nice neighborhood. Walk (or short drive) to town and beach. Wi-Fi quite dependable. Above-average rental property. Highly recommended. 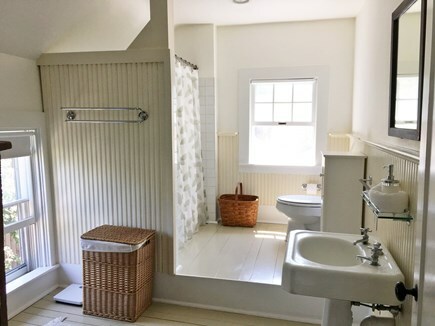 Charming, clean, comfortable. Excellent location. We were really pleased with this rental home. The location is perfect: downtown Oak Bluffs and its beaches are very close, just over a half-mile from the house. The property has two yards – one of them is completely fence-enclosed where the kids and our little dog were able to run around and play safely. The other yard is hedged-in and private. Just beautiful. You can tell the owner really cares about the place. The manager was very helpful; made everything hassle-free with our comfort and privacy in mind. To sum it up, it was even better than we expected it to be! Hoping to go back next year for sure.